The highest ranking police official in Central Visayas called for hastened investigations on killings in the region, particularly those allegedly carried out by gunmen who rode in tandem, in a bid to dissuade victims’ relatives from turning to armed groups such as the New People’s Army for justice. 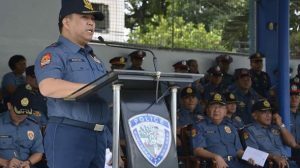 The NPA threat in the region is “real,” and the communist guerrillas tend to penetrate localities by earning the sympathy and support of residents, said Police Regional Office 7 director Chief Supt. Jose Mario Espino in his speech during the inauguration of the new Tagbilaran police station. Espino’s call for quicker probes covered both deaths under investigation and the killing of suspects during police operations. “That’s what I also told our police, to go revisit [issues] on those killed in operations—console with them, check on them because if we don’t focus on that especially victims of riding-in-tandem, they will find justice elsewhere,” Espino said. “Rest assured, these victims in deaths under investigation, your policemen are doing everything to really unmask the perpetrators of these crimes,” he added. However, Espino did not elaborate on whether NPA rebels have already infiltrated Bohol.